Arandana Mayor is a children's blogger and writer, mother of two and nature lover. She likes to write about ecology and her mission is doing her best to leave her children in inheritance a better world. 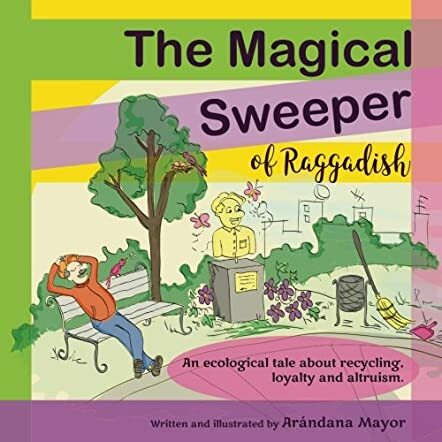 The Magical Sweeper of Raggadish by Arandana Mayor is an educational book with an excellent concept revolving around the relevant topic of recycling. Seraphim, an elderly sweeper, lived in the small town of Raggadish. He was hardworking and he was the best sweeper the town had ever had. He liked teaching the children of Raggadish to take care of the environment. The Raggadishians were grateful for his services. A new mayor comes to town and he moves into a house in Seraphim’s neighborhood. He is a sullen man with two spoiled children, Marilda and Leopold. Though Raggadish did not have a mayor earlier, the people trusted the new mayor and approved of his unique ideas to save the wonderful city of Raggadish. An unfortunate incident sees the mayor fire Seraphim from his job. From that day onward the city became filthy. Will the mayor and people of Raggadish be able to make the city clean again? The story is excellent and helps children understand the importance of loyalty, altruism, and recycling waste to keep the environment clean. The illustrations breathe life into the story and characters and give them a good pace and movement. It is a good story for read aloud sessions in classrooms and school libraries because of its content, and will also make a good book for bedtime story-telling. This book is a must-have and a must-read for everyone, including children and adults, because it makes readers aware of the importance of recycling and keeping the environment clean.